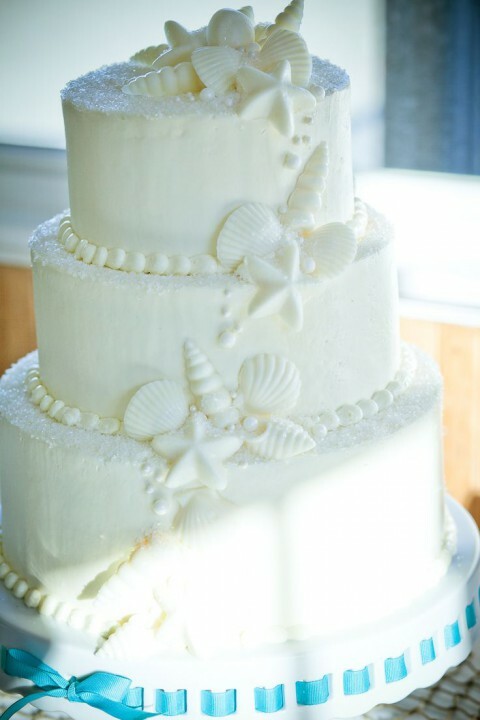 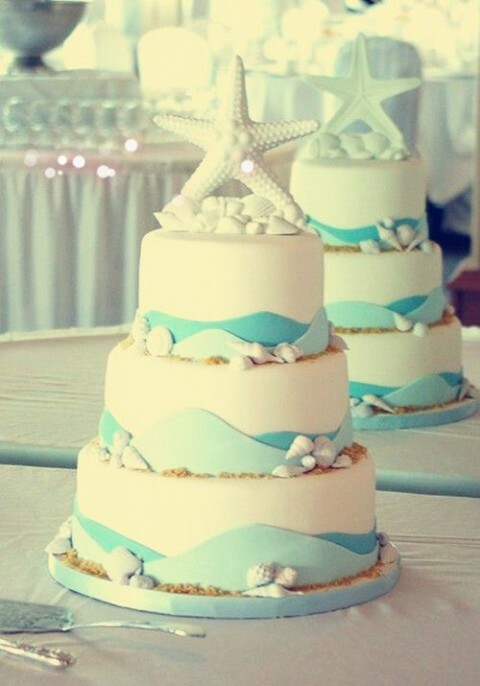 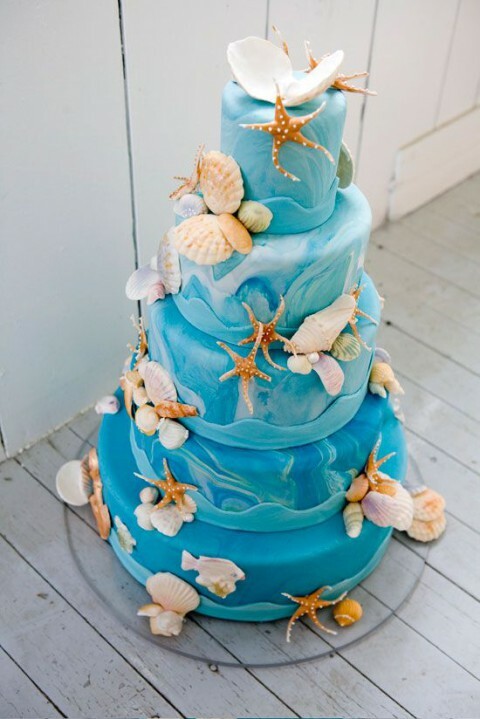 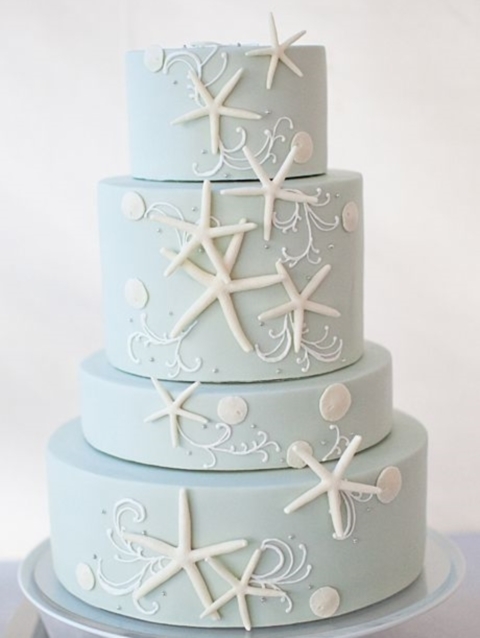 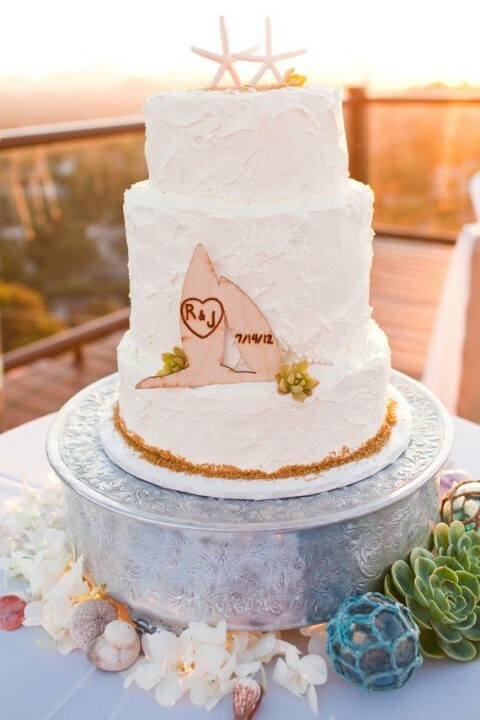 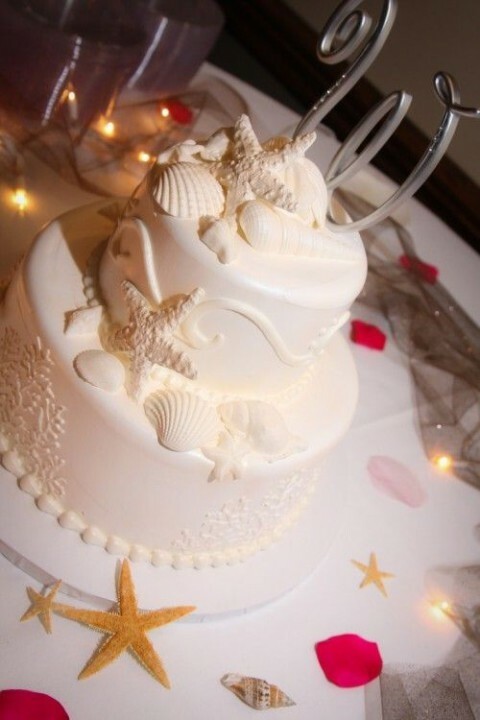 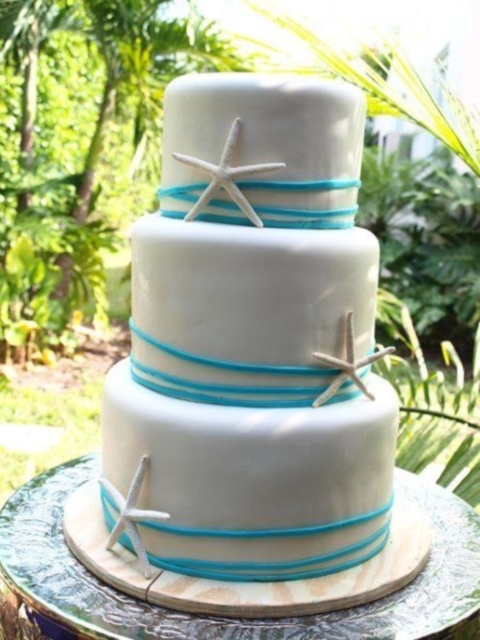 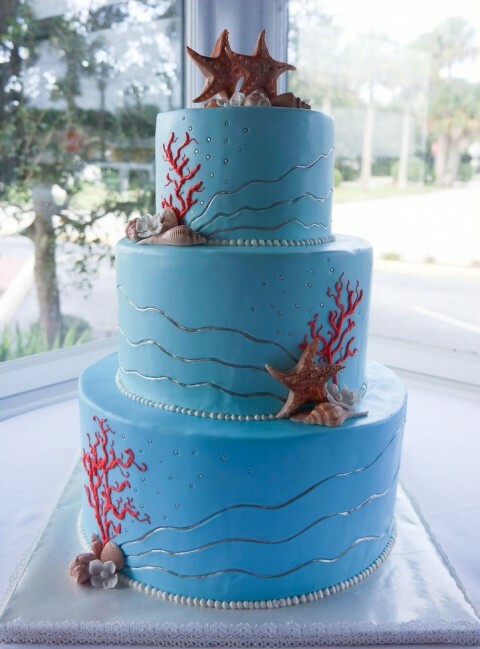 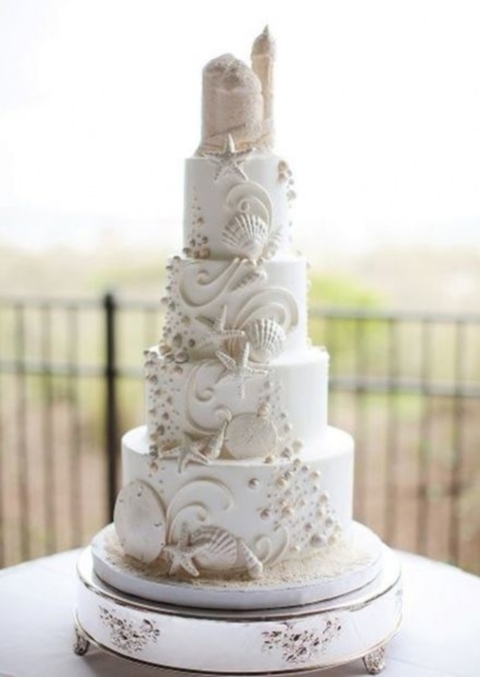 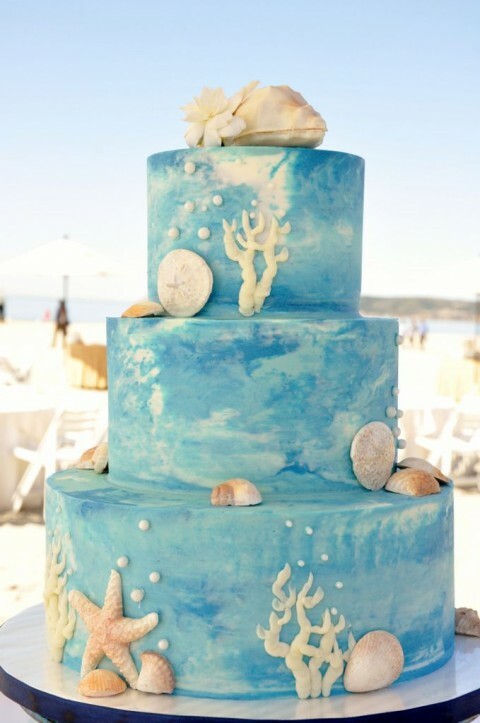 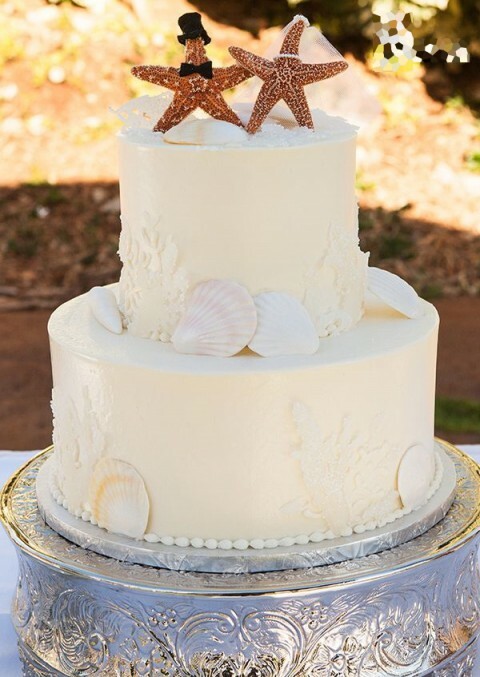 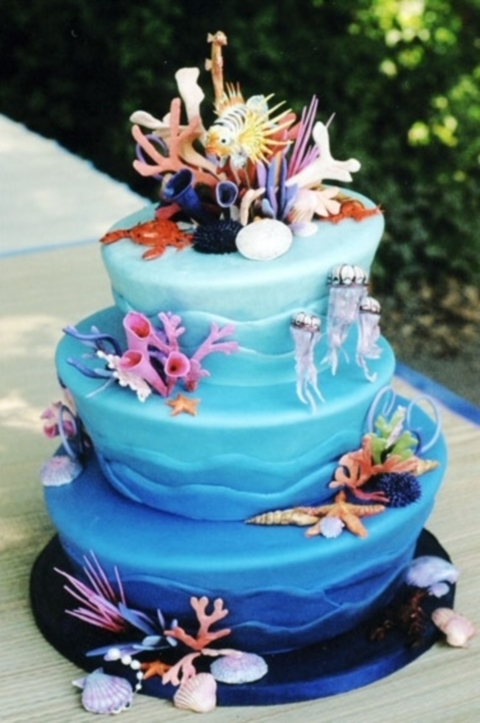 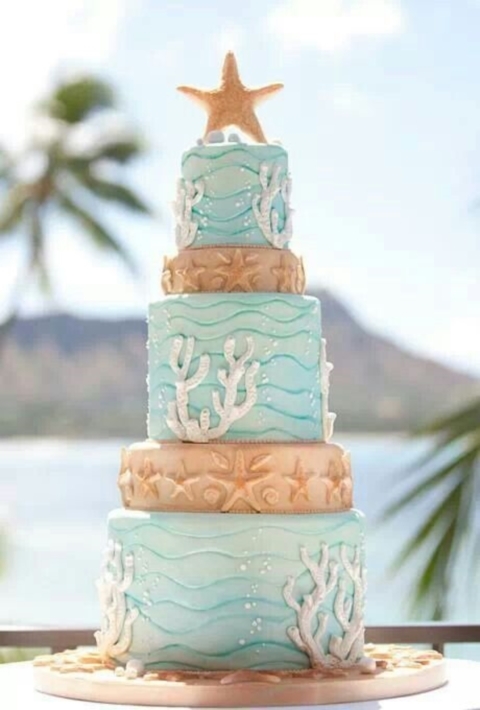 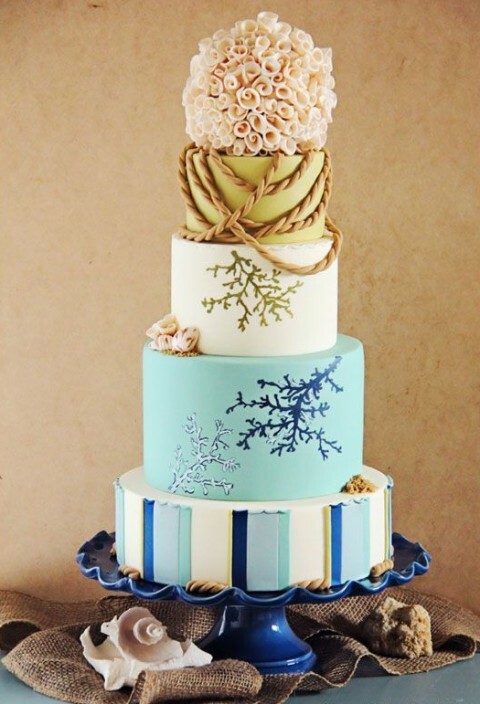 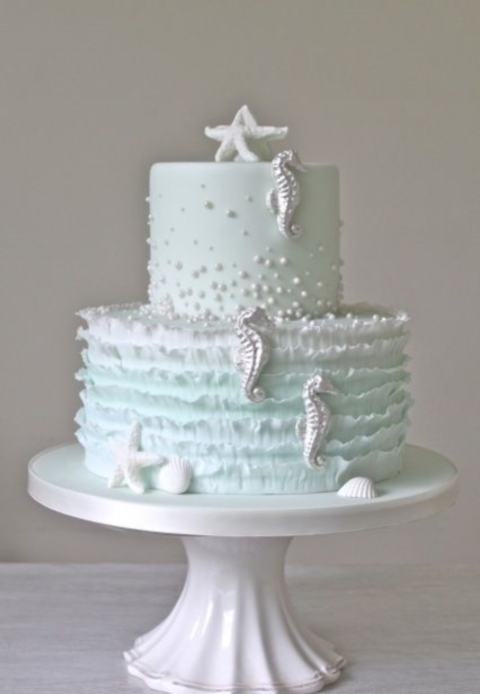 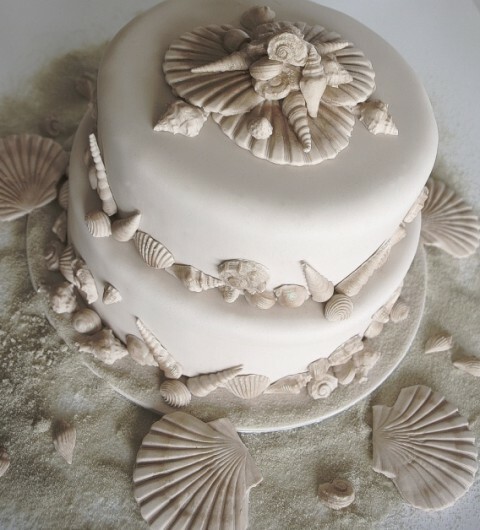 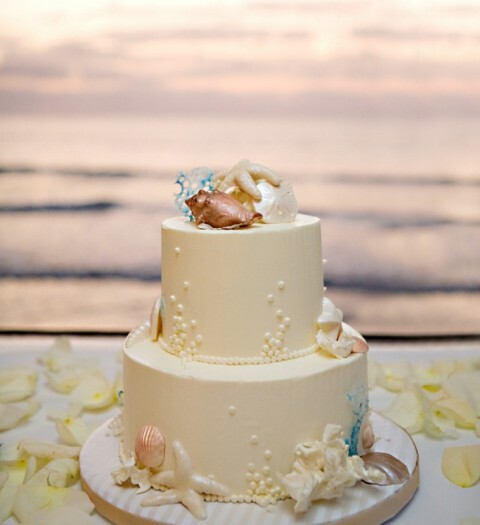 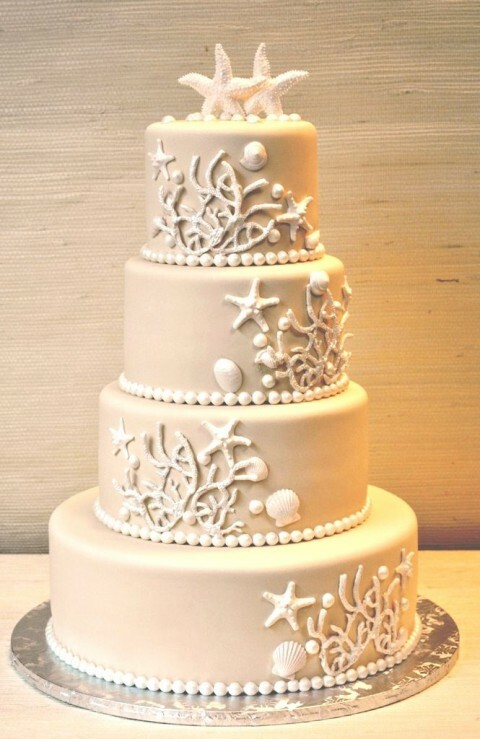 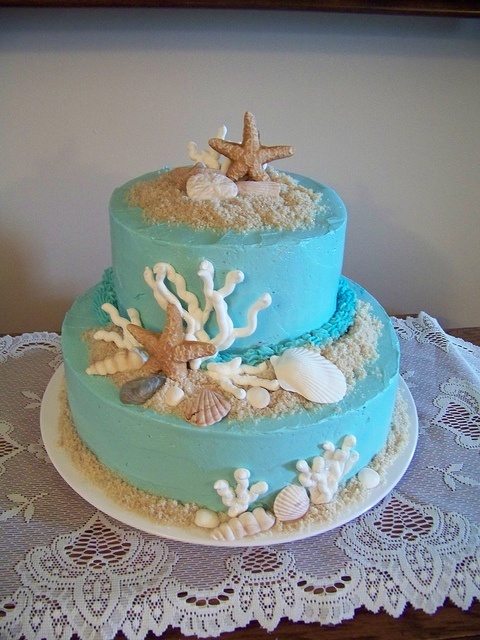 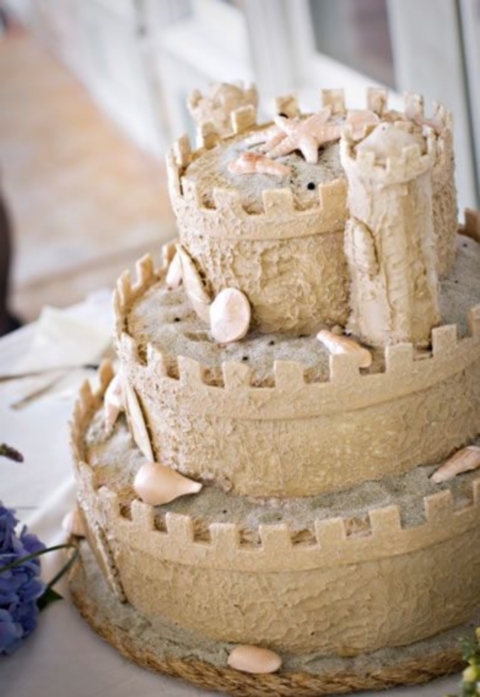 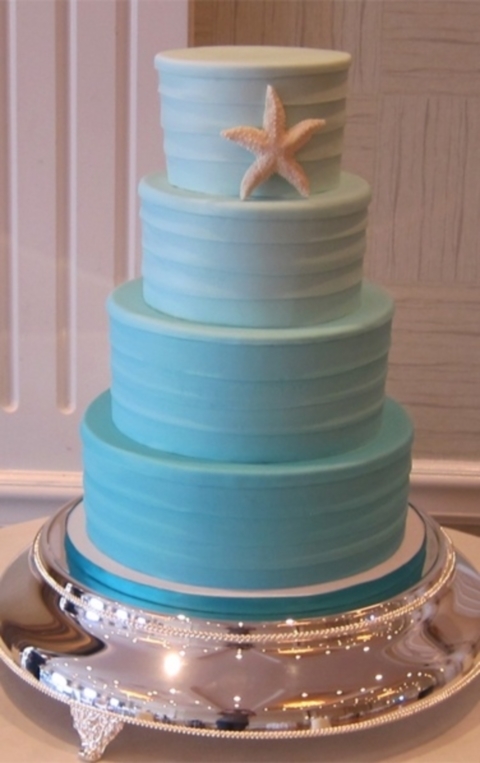 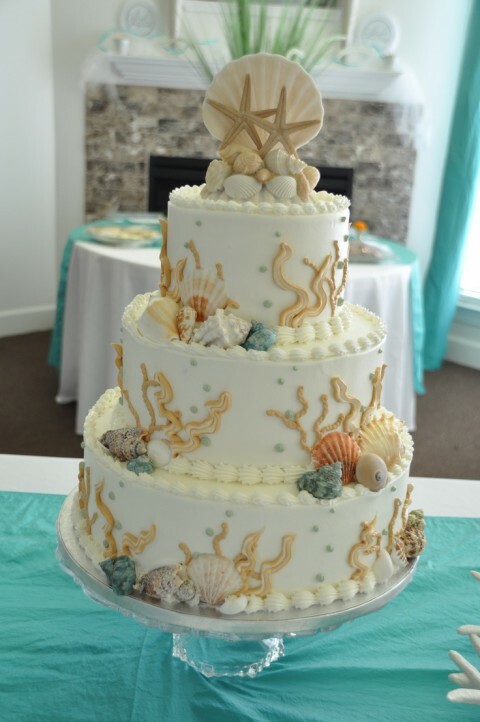 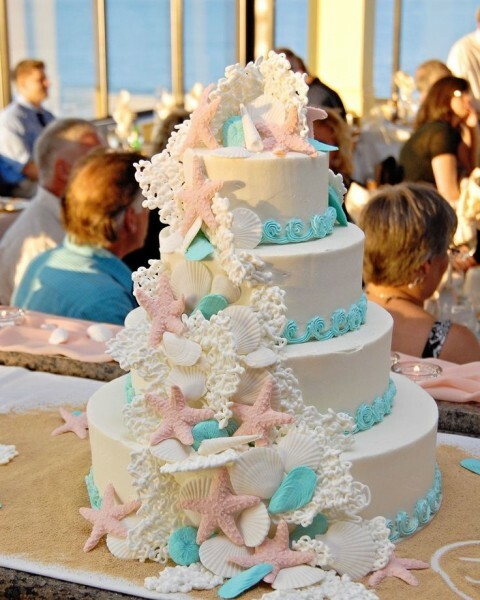 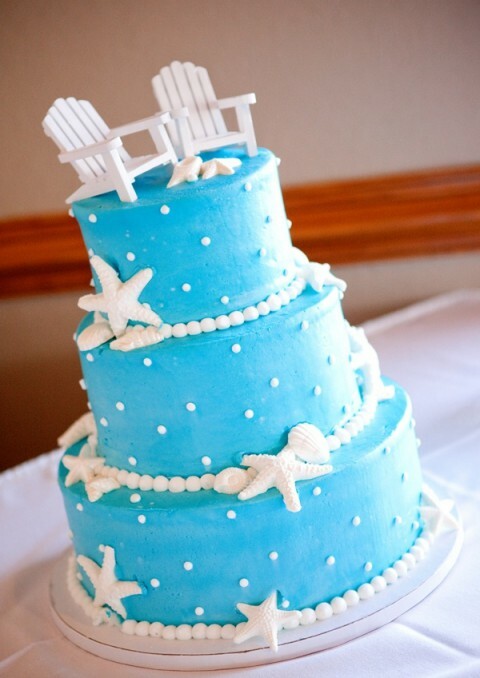 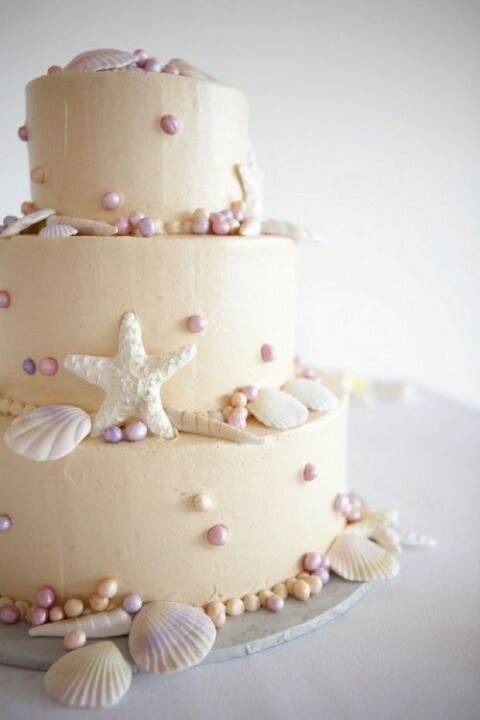 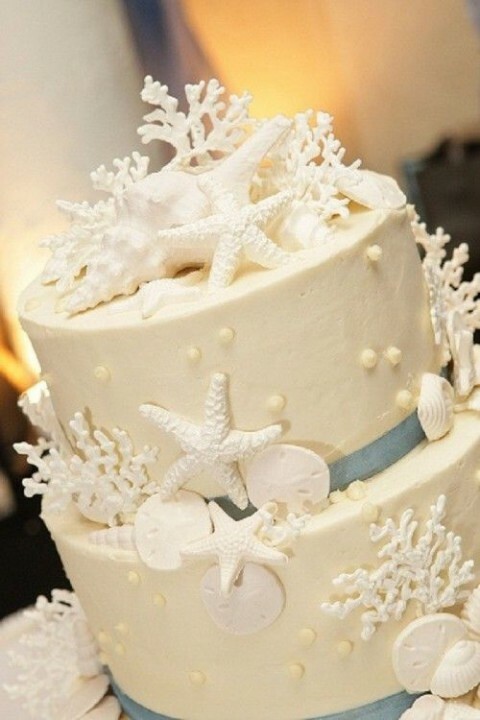 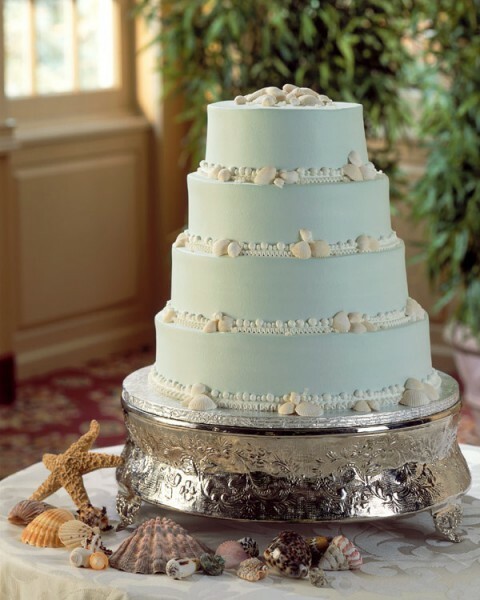 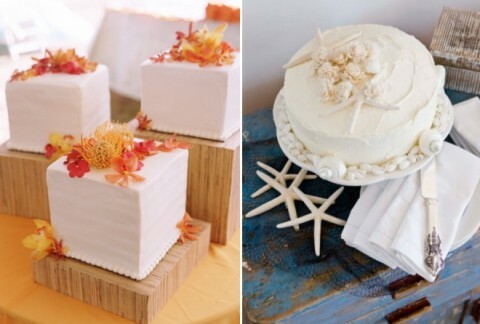 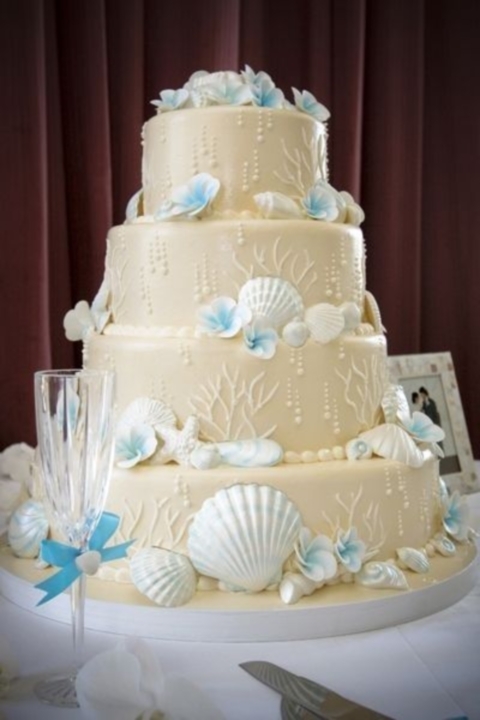 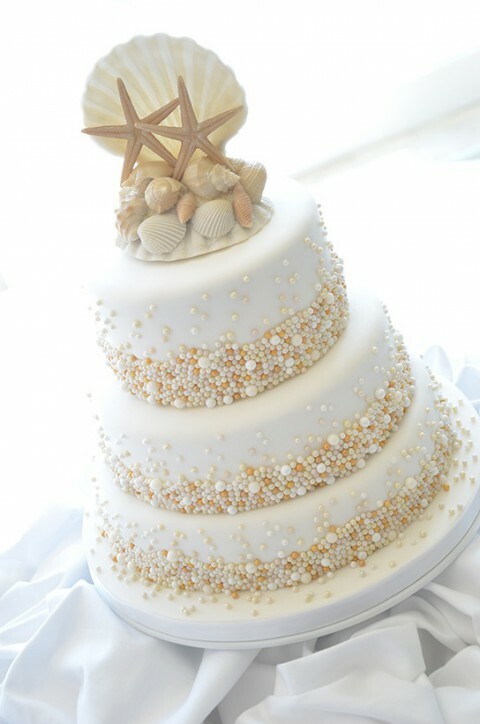 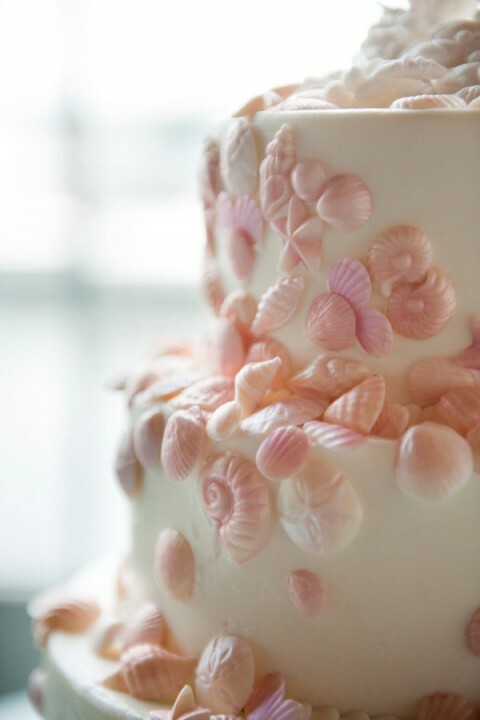 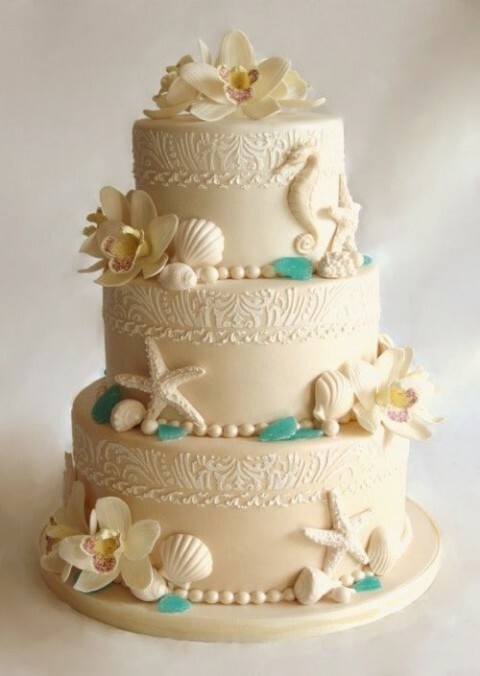 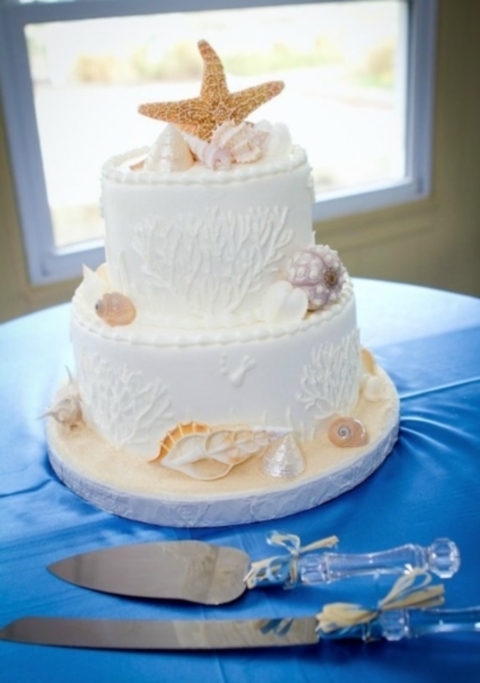 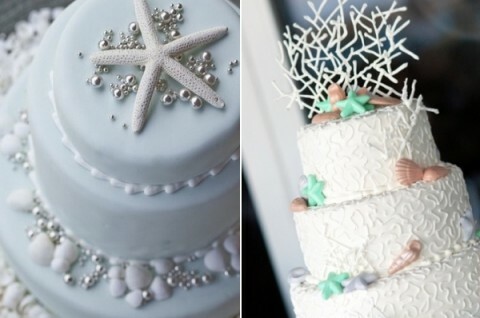 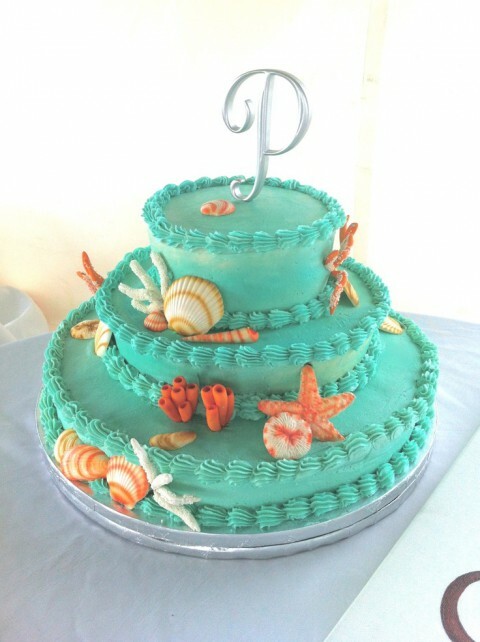 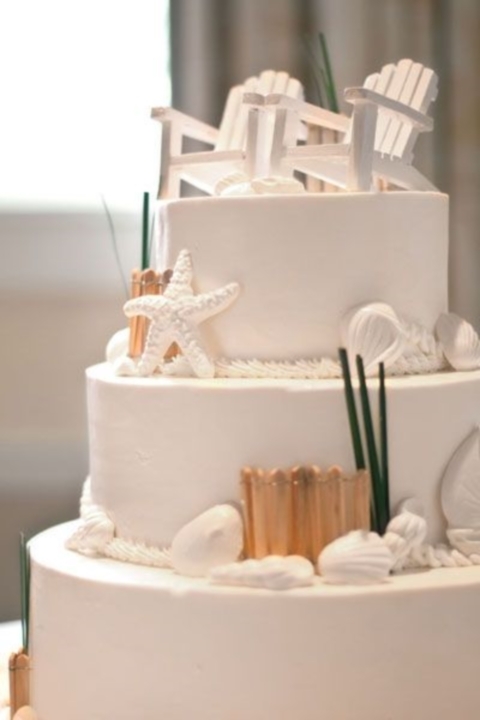 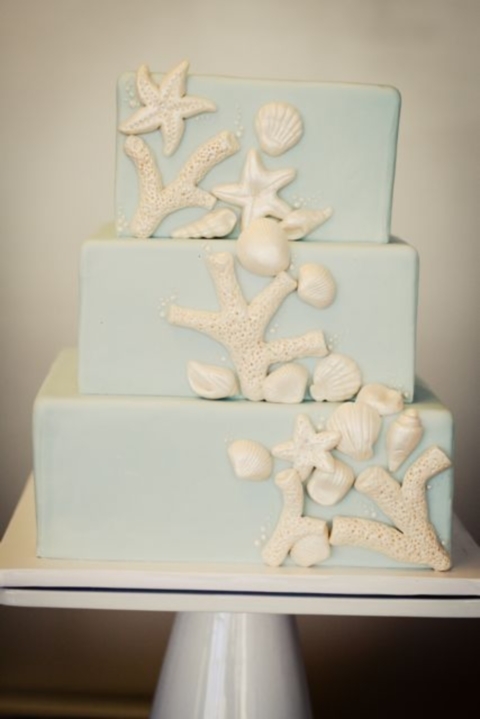 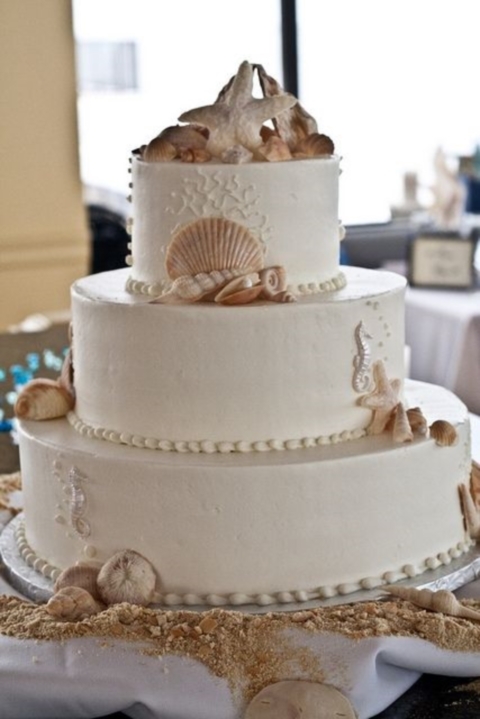 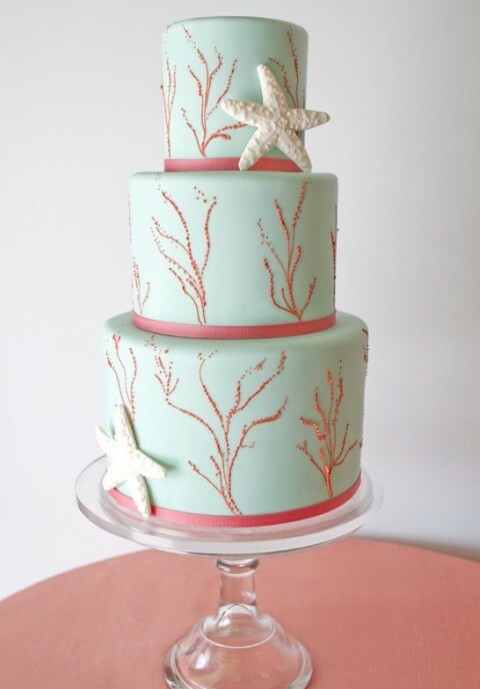 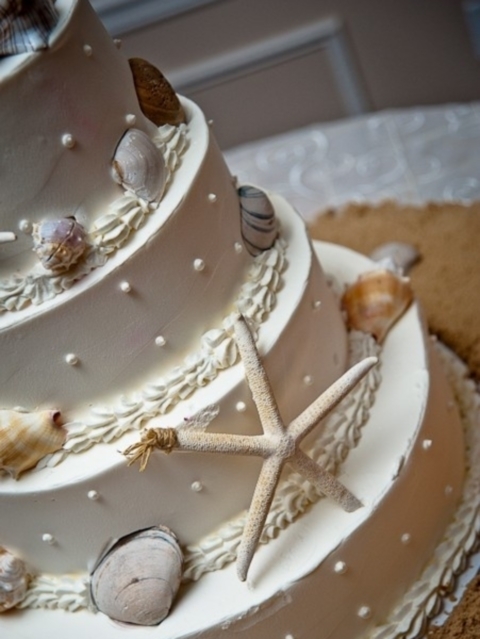 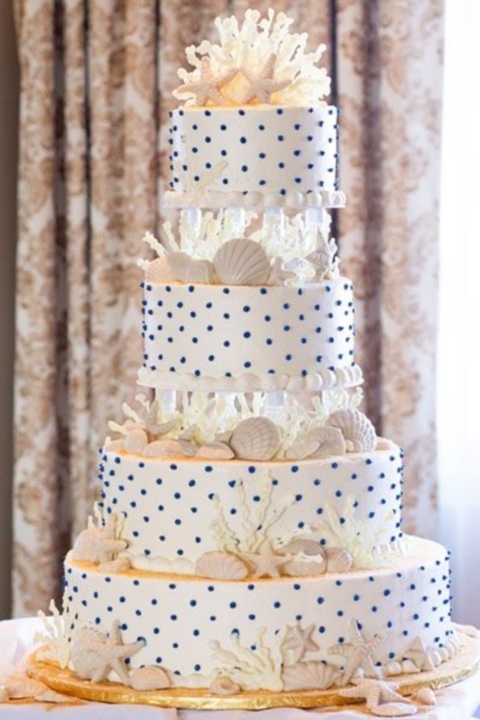 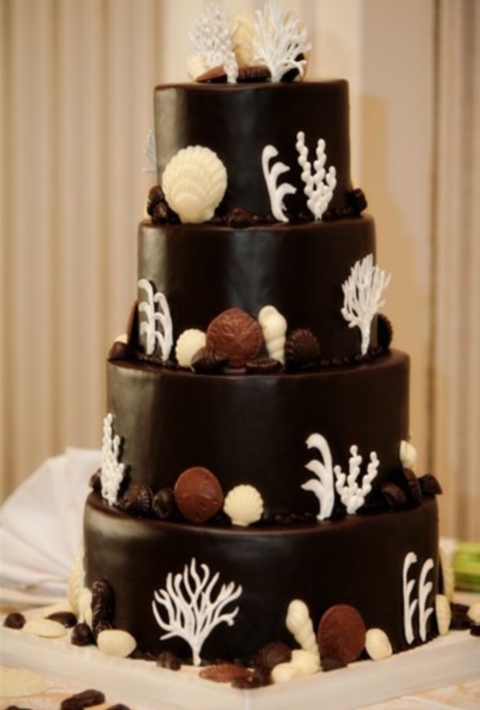 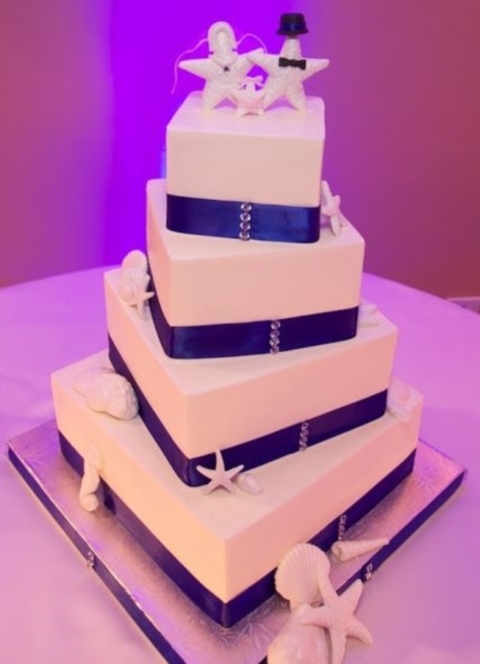 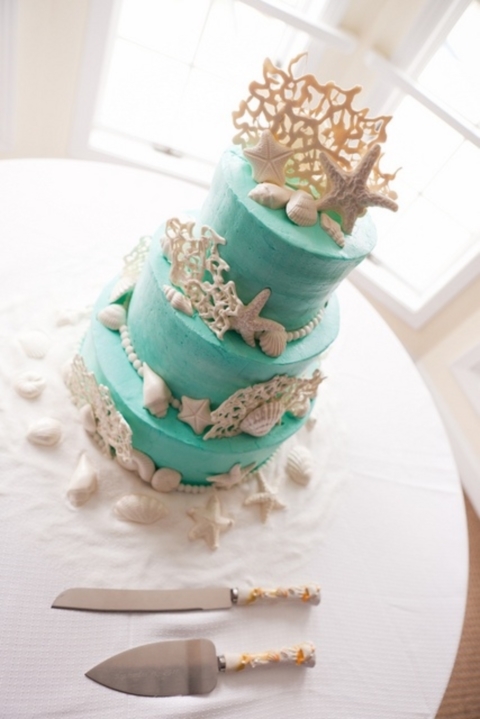 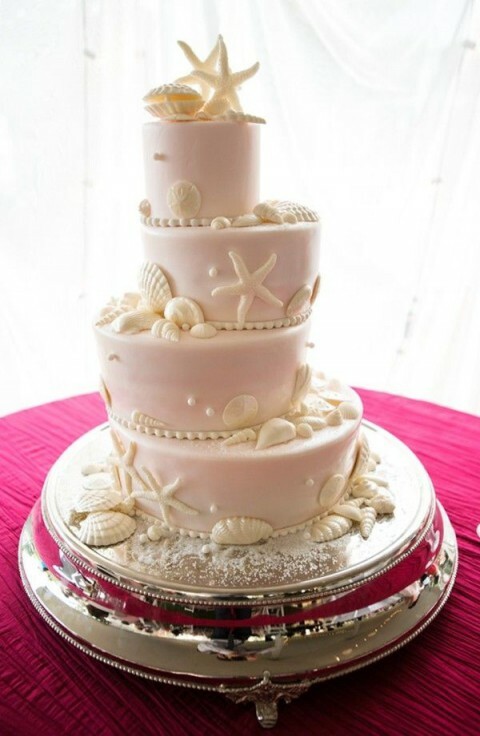 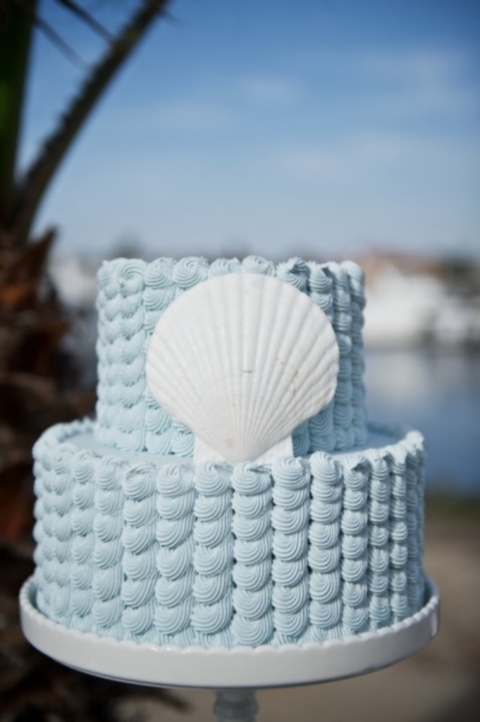 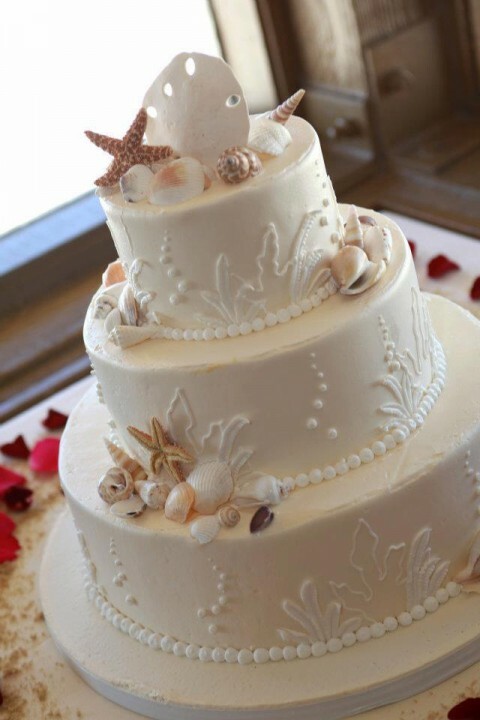 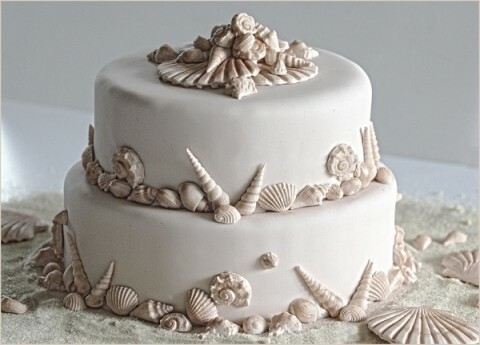 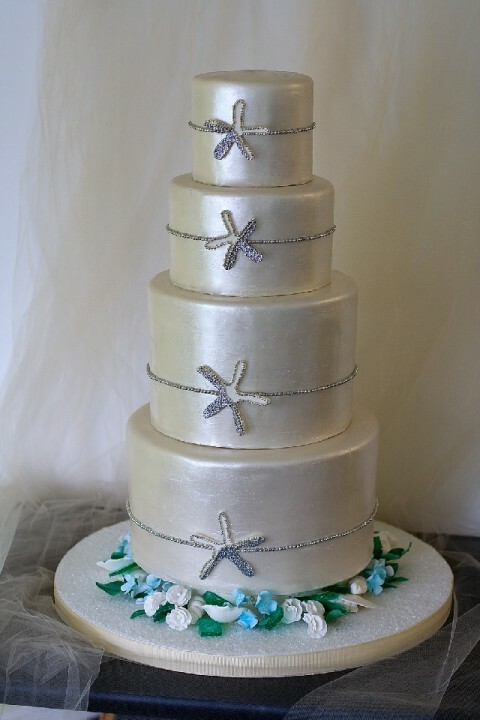 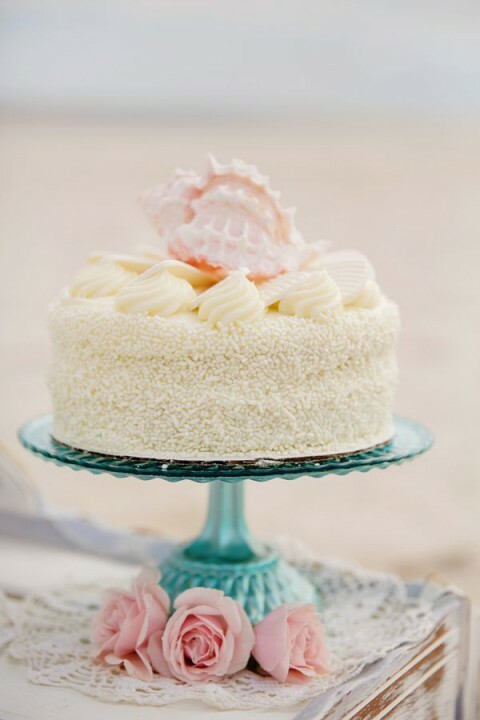 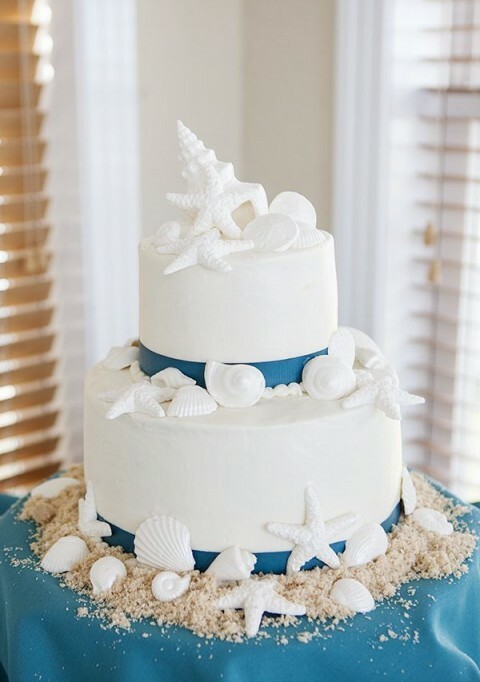 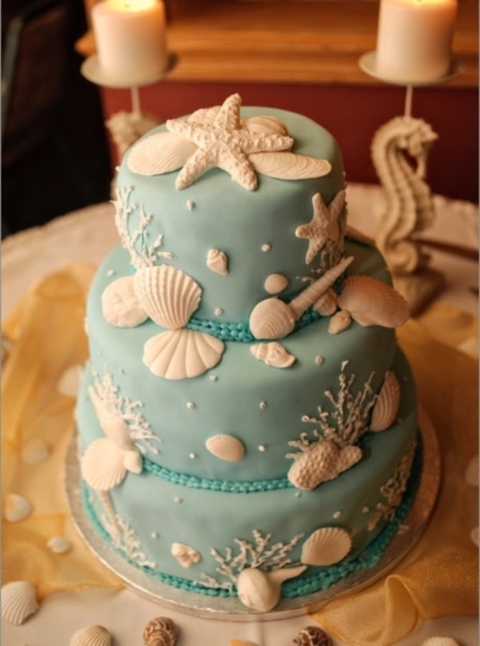 Beach weddings excite with their sea-inspired details and decorations, and a beach wedding cake is no exception. 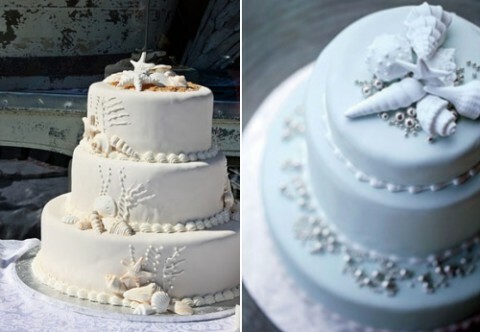 Today we’ve gathered some adorable cakes that are not only yummy but also look as pieces of art! 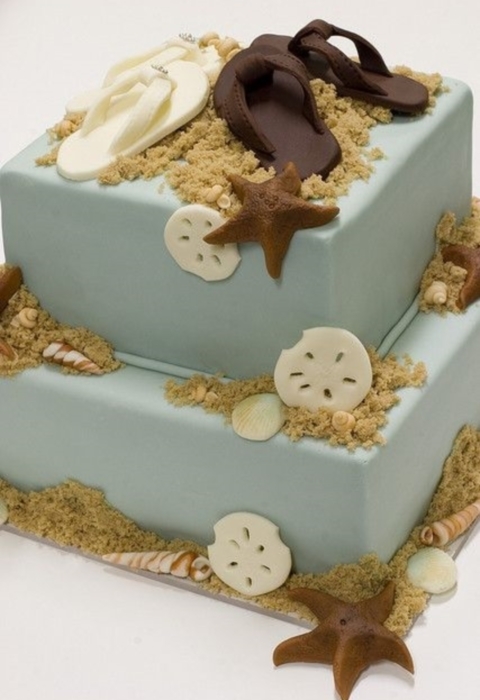 Confectioners create real beach-inspired masterpieces: cakes decorated with starfish, shells, sand, corals, pearls – and all that is edible! 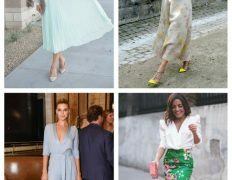 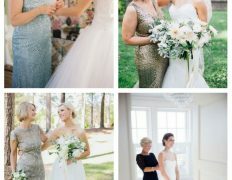 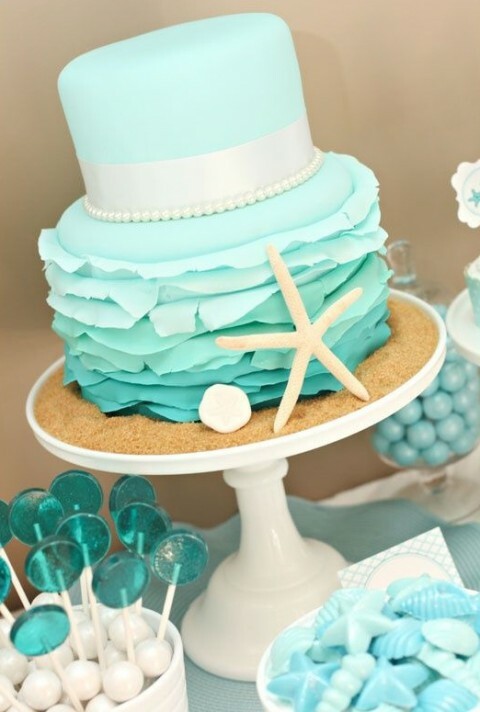 The colors really inspire: blue, aqua, teal, green, mint and coral combined with white or sand color. 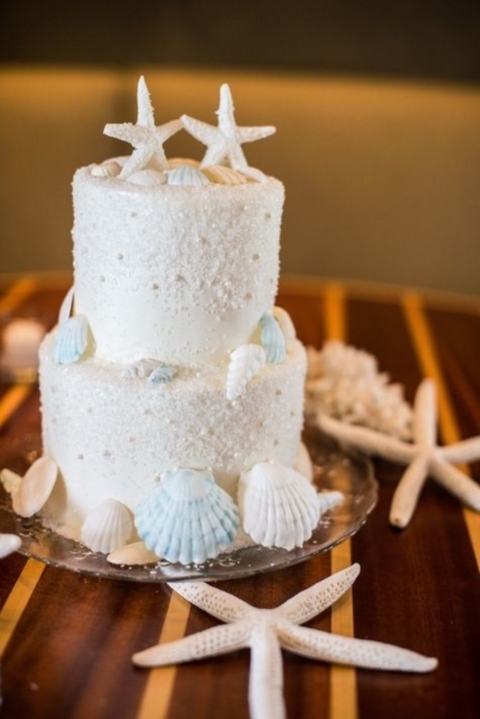 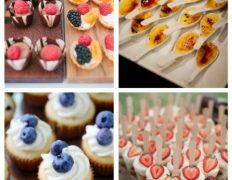 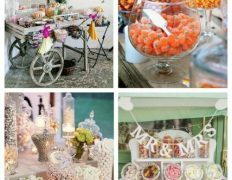 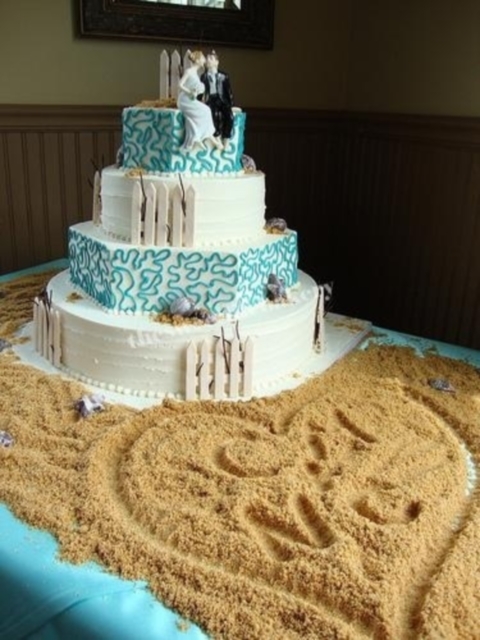 There are also sweets considering one of the latest trends – naked wedding cakes – just one part is naked and the other one hints on the fact that the wedding is a beach one. 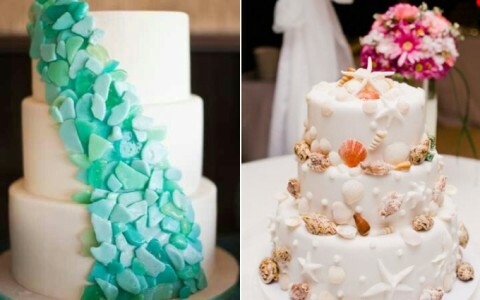 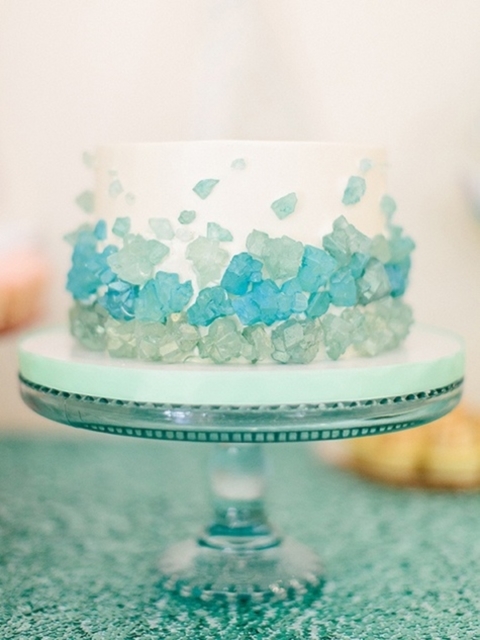 For those who love minimalism but still don’t want to refuse the beach-inspired design there’s a good idea – sea glass decorated wedding cakes. 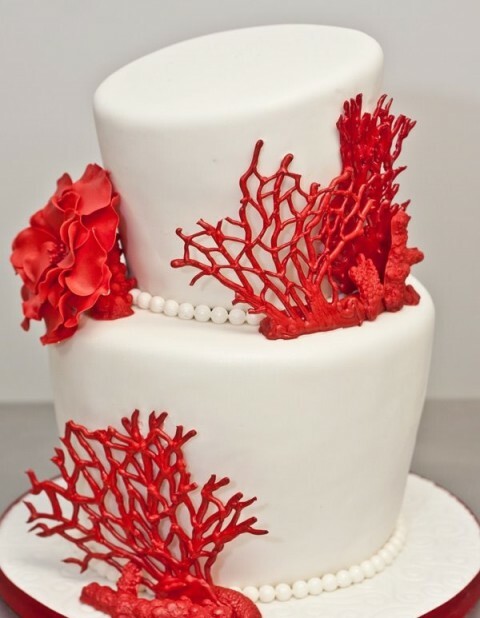 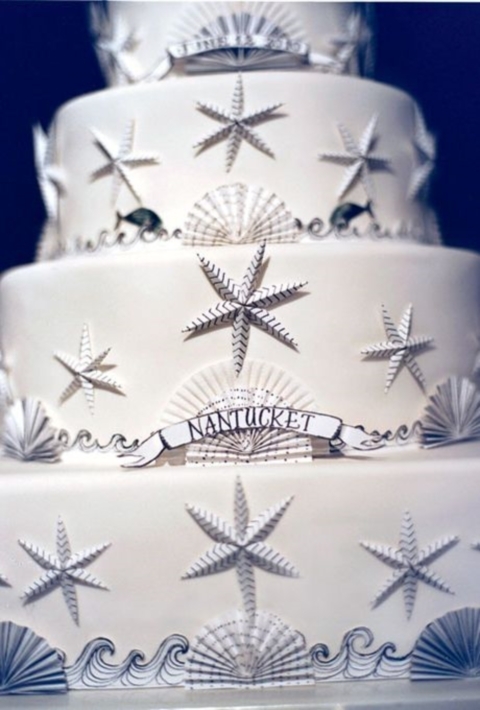 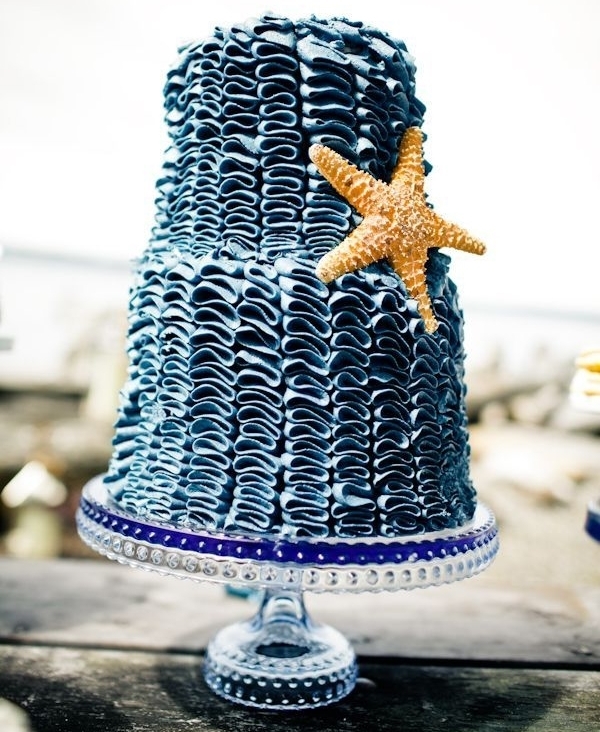 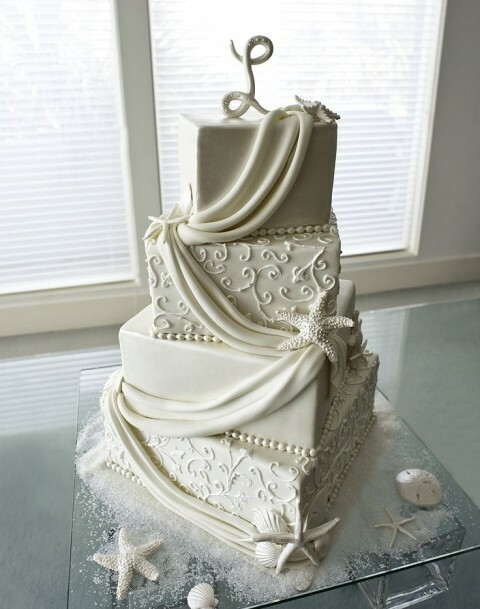 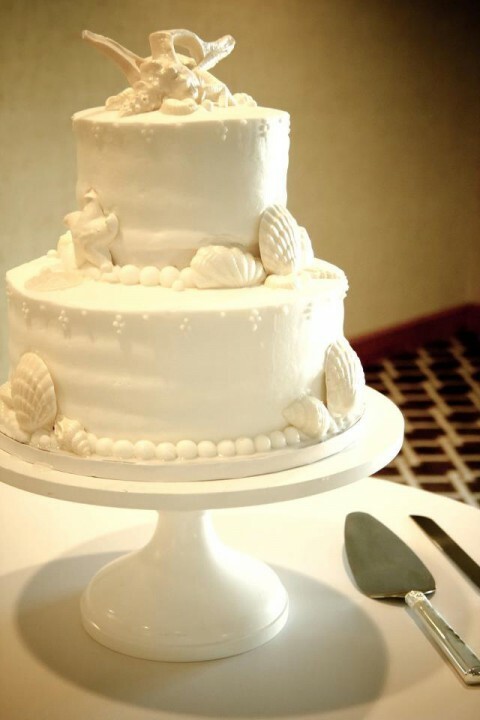 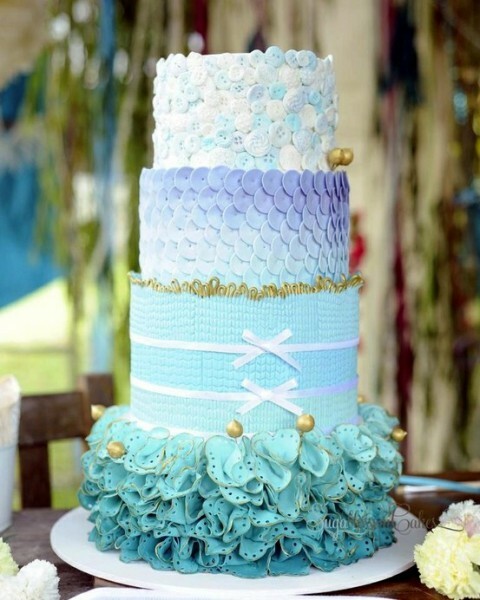 If you prefer glam, order a ruffled wedding cake with just some sea-inspired decorations. 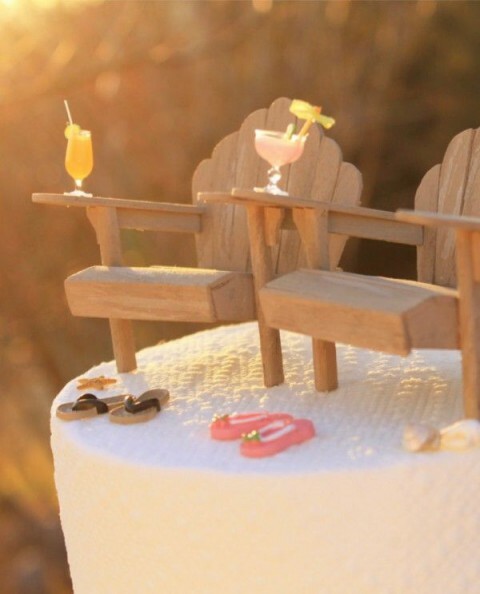 Funny cakes are very much in place: I just love those sweets with lounge chairs, flip flops, cocktails and other cutie edible toppers! 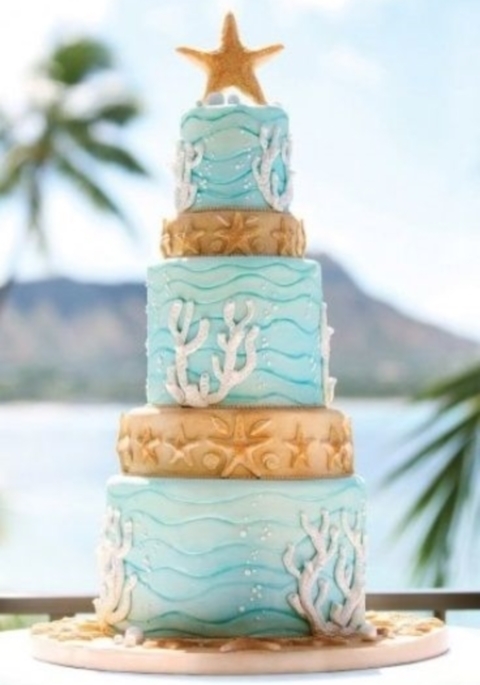 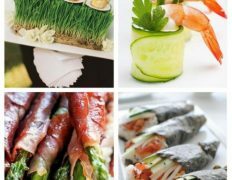 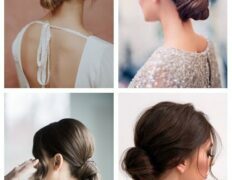 Dip into the pics below to get inspired! 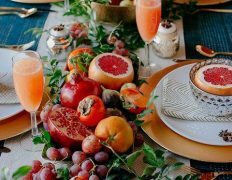 I believe this internet site contains some real excellent information for everyone :D. “Believe those who are seeking the truth doubt those who find it.” by Andre Gide. 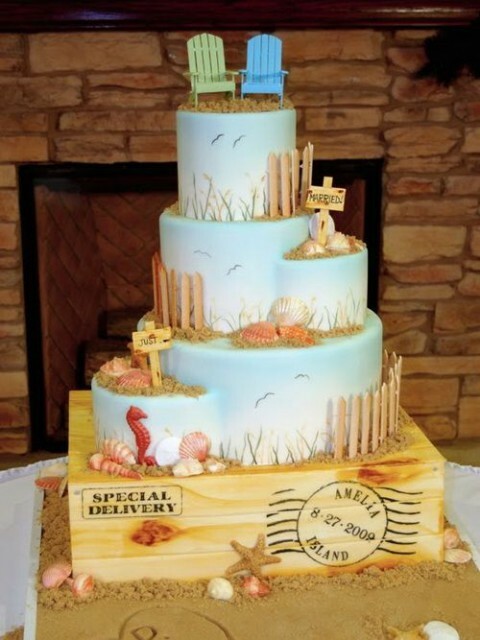 you are in reality a just right webmaster. 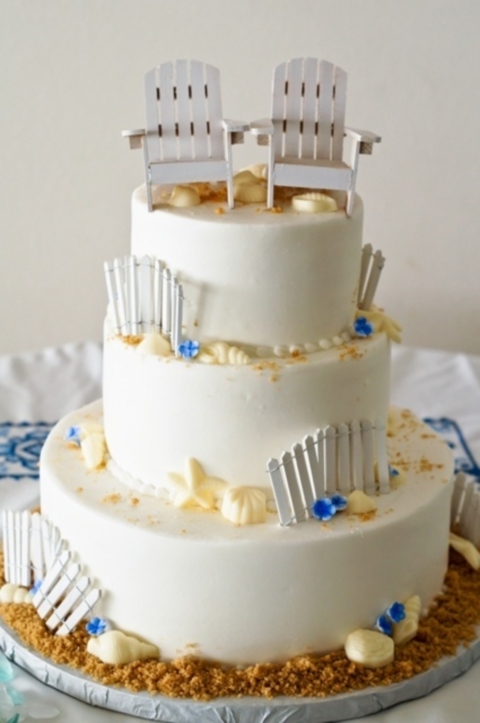 The site loading pace is amazing. 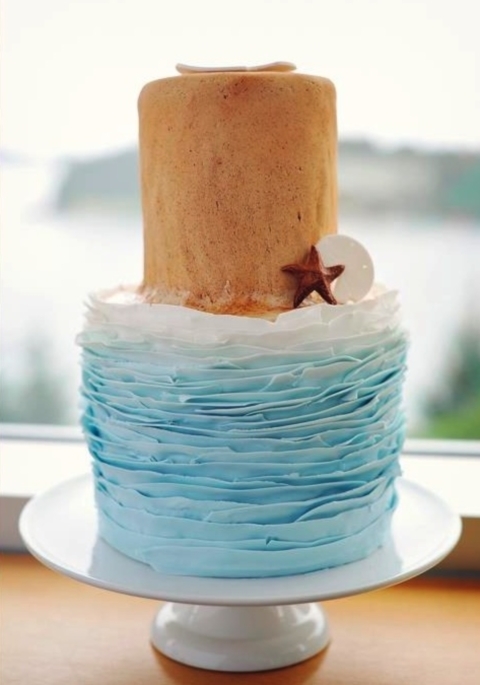 It sort of feels that you’re doing any unique trick. 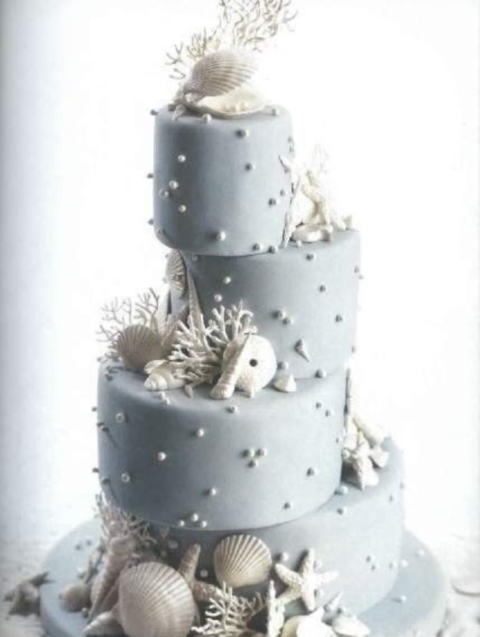 Also, The contents are masterwork. 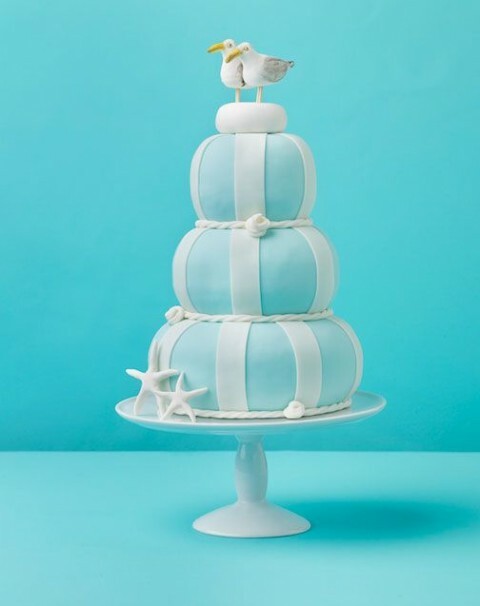 you’ve done a excellent job in this matter! 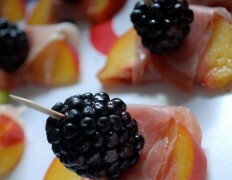 Thanks for the good writeup. 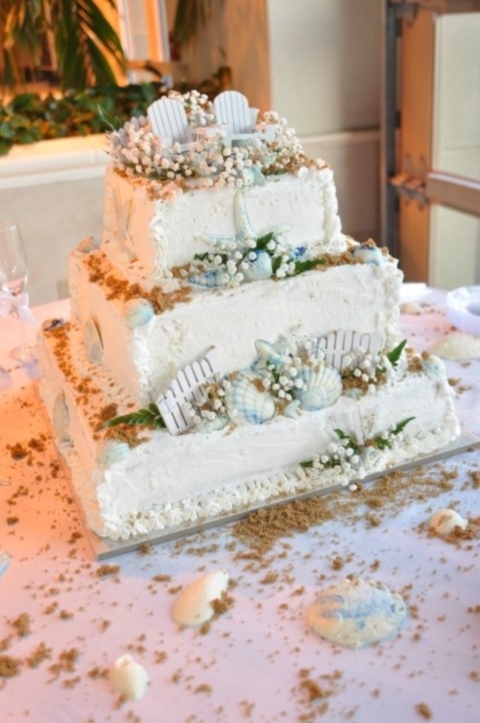 It actually was a leisure account it. 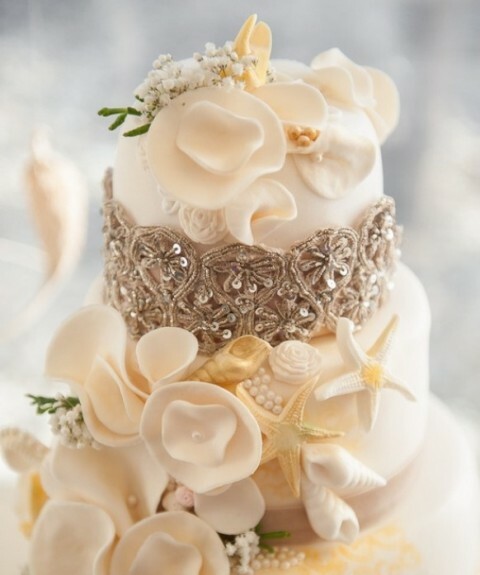 Glance advanced to more brought agreeable from you! 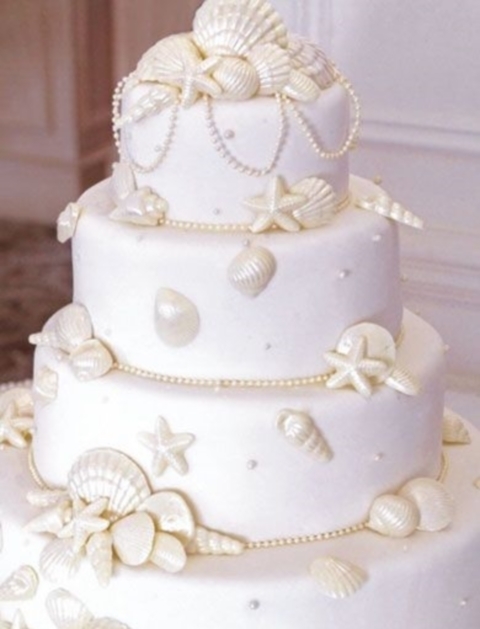 By the way, how could we keep in touch?